A hairy man in leaf-patterned shorts sits on a yellow chair in front of a garden wall. 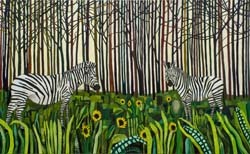 In the background looms a thick green tangle of plants. 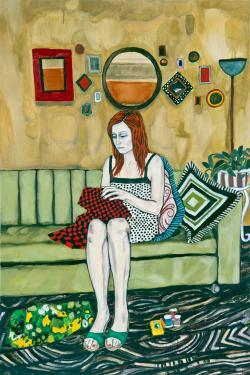 A little way off, a barefooted woman also sits on a chair, one hand in her lap. She looks over at him. He looks at a dog that strikes a fighting pose on the lawn. Each seems to be waiting for the other to make a move. These two individuals and their pet are introduced to us in the title of this work as Shio, Jonas, Robot (Outside) (2008). In recent years, as well as paintings on canvas, Raffi Kalenderian has produced a series of works on paper using watercolours, graphite and coloured pencils, sometimes combined in collages with found photocopied material. Most of Kalenderian"s protagonists are depicted in full-length portraits in domestic settings, the works" titles giving us their first names only. In shimmering colours, attractively decorated private rooms and lush front gardens offer glimpses of household interiors or studios. 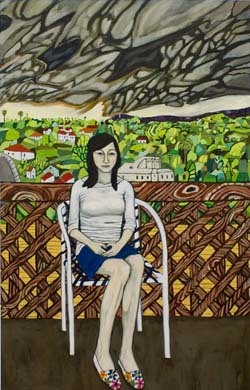 But the works in this exhibition, titled "Satellites", never offer a wider view to the horizon or out into a cityscape. 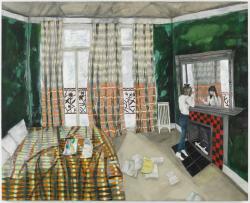 Instead, Kalenderian"s backgrounds present an almost claustrophobic closure. This is due primarily to a simple visual trick that reinforces a "faulty" perspective: at times, things our perception would register as being further away are shown at the same scale as motifs in the foreground. As a result, background spaces are reduced to a two-dimensional "curtain" and the figures appear as though placed in front of sumptuous drapery or stock backdrop in a portrait studio. Most of these backdrops are fully developed, but some are merely sketched out in neon colours. Raffi Kalenderian"s solo show at Black Dragon Society consists of portraits of young, disaffected twenty-somethings in an LA jungle of sorts. 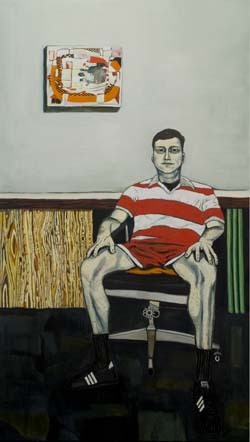 Painted with rather crude brush strokes, the people in his paintings are portrayed at an alienated distance - they sit or stand in wooden, stiff poses, paying attention but trying hard to come off like they are not. What makes Kalenderian"s work compelling are the dark and gothic undertones of his portrayal of youth and landscape, interiors and exteriors. 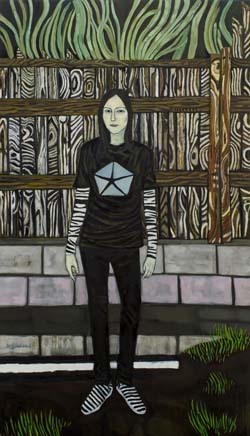 In "Rachel" (2007), a thin, angular young woman with dark hair stands awkwardly, her zebra-striped undershirt and shoes matching the zebra stripes that are the trunks of elongated trees behind her, the ironic geometric Chrysler logo on her t-shirt somehow mimicking the grey bricks in the wall. In all of his paintings, patterns on clothes, furniture, walls, architecture, and trees simultaneously collide and become the same thing. Figures blend into their backgrounds, becoming as inanimate as the objects around them; clothing (as style) becomes abstracted, and abstractions (as pattern) become things. 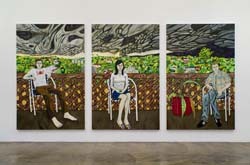 "Highlanders" (2008) is a triptych of three panel paintings, each portraying a person sitting in a plastic lawn chair on a porch overlooking a vast, and oddly green LA landscape. Ominous black clouds hang in the huge sky above them in fat swirls. In Kalenderian"s world, even the sky becomes as tangible and reified as a chair. It"s hard to resist Kalenderian"s cool and self-conscious paintings, especially his portrait of a portrait painting ("Three-headed Dog" 2007). In oval format, like a bad but oh-so-good thrift store painting from the 70s, Kalenderian"s rendition of a three-headed, ghoulish, wild dog tops the show"s dark, vampiric flavor. 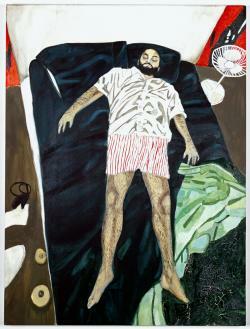 Me.di.um is pleased to present "Wicked Waters", an exhibition of work by Raffi Kalenderian. The solo show of oil paintings and drawings is currently on view at Medium in Gustavia. It is a unique body of work specific to St. Barthélemy and the experiences the artist had while on residency. 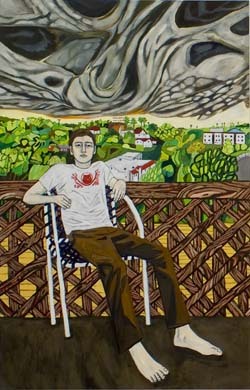 Raffi Kalenderian"s work consists primarily of portraiture. 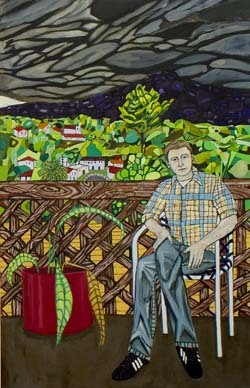 His portraits depict mostly close friends and family in intimate settings. The portraits Kalenderian was making on the island have a common thread characterized by a vampirical animism, a ghoulish pallor and a dense field of color. For Kalenderian portraying a person provides an excellent forum to develop a new mythology. The act of painting or drawing a person provides him various options and directions to choose from: observation versus distortion, fact versus fiction, investigating the psychology of the sitter versus keeping an emotional distance. "The one landscape painting "Mein Zuhause ist das Meer" was an attempt at taking mundane elements from around the island of St. Barthélemy and having them coexist with the fantastical", Raffi Kalenderian says. "The hope was, that there would be just as much psychology present in that painting than in any of the portraiture. 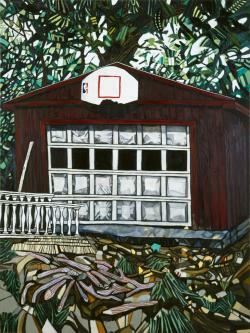 The whole body of work tries to put forth an alternative mythology about the island. A place where tans are replaced by ghoulish, corpse-like pallors, plants turn into insect legs, and trash becomes the recipient of radiation propagating from a black sun/void. Come to think of it, I am very happy that this show is up for Halloween. What a great pair, right?"